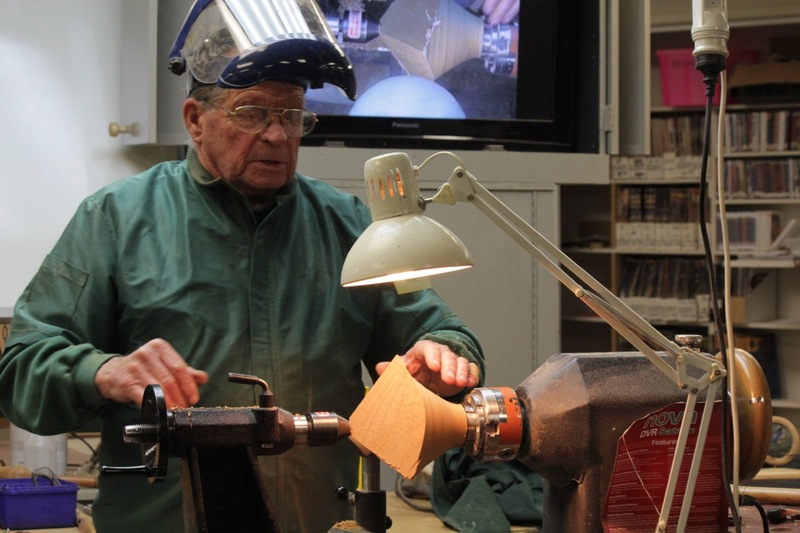 Three Wings – Colin Wise | South Auckland Woodturners Guild Inc. 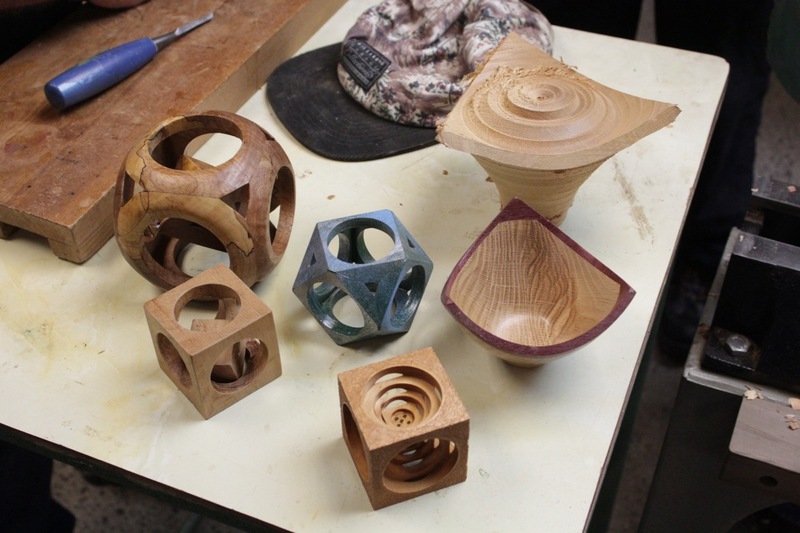 This Wednesday Colin Wise demonstrated the creation of a three-cornered bowl with upward-pointing wings, after showing us a number of other ways to use a cube of wood. 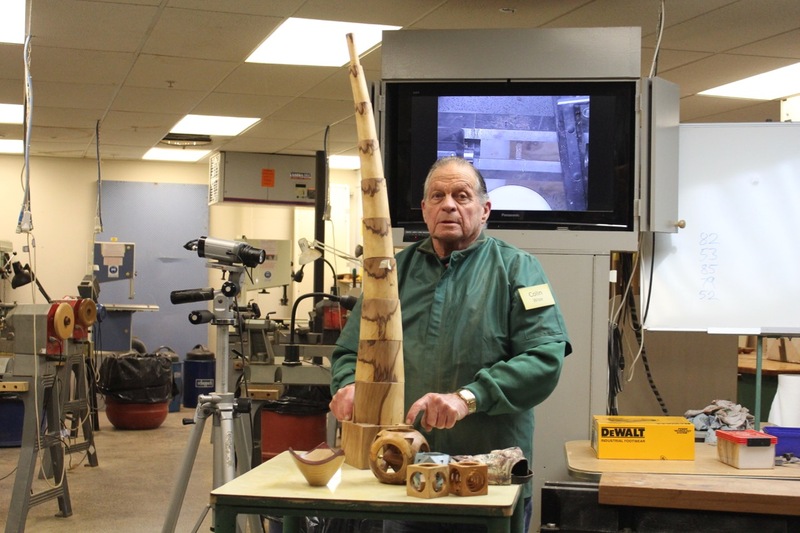 These examples included several hollowed boxes with a variety of openings and included shapes, and an amazing tower of graduated thin-walled cylinders, resting on a cube from which these cylinders were cut by bandsaw. 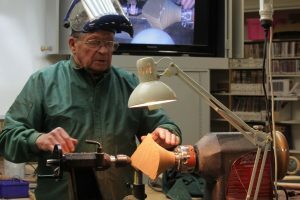 To create the winged bowl, Colin mounted two opposite corners of a cube between centres, pressing the cube between the headstock spindle and tailstock cup. When spinning the cube, we saw separate points created by two sets of three corners. With the lathe running at about 1000 rpm, Colin turned away the set of three corners nearest the tailstock to create and finish the external surface of the bowl, as well as a spigot at the tailstock end. After removing waste beyond the spigot, he reversed the workpiece to hold it with a 50mm chuck. He then turned away the wood that was now at the tailstock side of the three points, creating three wings. 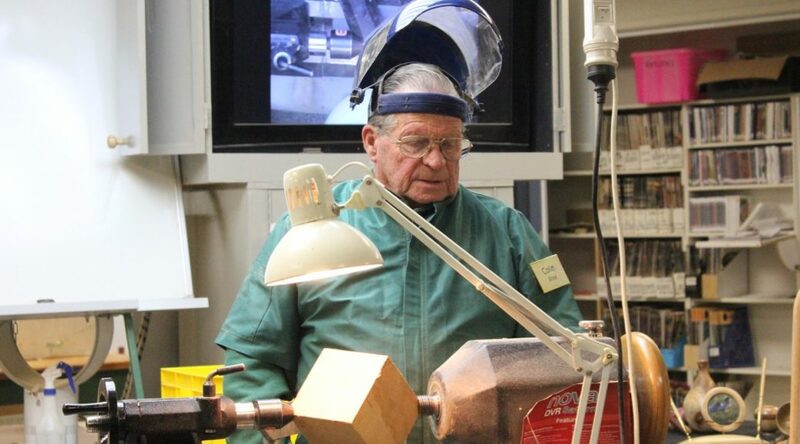 When the spindle of waste between the points and the tailstock became thin enough, Colin knocked it off and then turned the inside of the bowl at higher speed (about 1400 rpm) using a cup tool , thinning the wings at the same time. 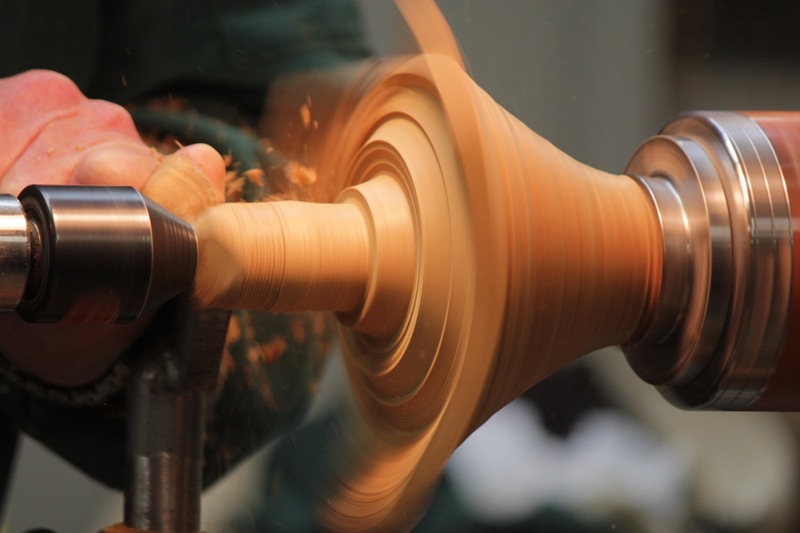 Interior sanding required care given the risk created by three points spinning around; Colin suggested shaping a curved wood-and-Velcro sandpaper holder to reach into the bowl while keeping the fingers safe. He used a sanding block to smooth the flat wing surfaces. 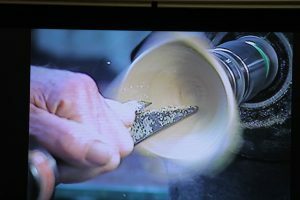 Colin pointed out the tearout that is inevitable in turning a cross-grained bowl, and suggested using sanding sealer during the final cuts, to minimise this. He then described finishing the outside and the foot with the bowl held between centres using cushioning at the headstock end to protect the inside surface. 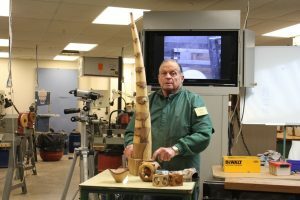 Throughout, Colin repeatedly emphasised the need to check the alignment each time the workpiece was reversed, to ensure the bowl remained perfectly balanced. 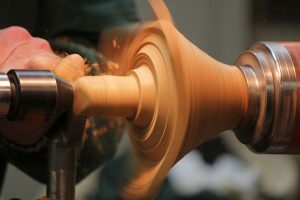 He agreed with members’ suggestion that the order of events could be modified to create a similar bowl with the corners of the rim pointing down instead of up. Thanks, Colin, for a demo that was carefully planned and brilliantly executed.